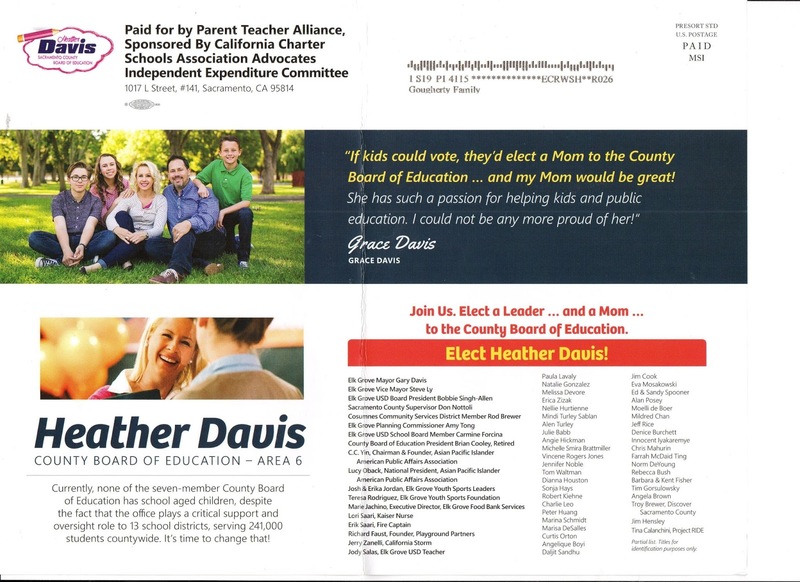 Voters in the race for the Area 6 seat of the Sacramento County Office of Education received yet another mailer from candidate Heather Davis. While the wife of Elk Grove Mayor and charter school employee Gary Davis mailer's content is unremarkable, it is noteworthy for what it does not contain. The "If Kids Could Vote" mailer contains much of what you would expect to find for someone running for a board of education. Concern for children, oversight and obligatory endorsements. This mailer, like earlier ones sent on behalf of Davis, is ostensibly from her daughter Grace. 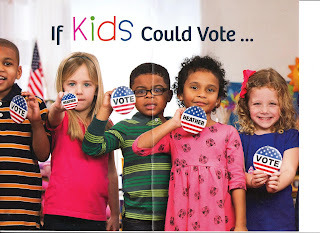 The "quote" from the young Ms. Davis says "If kids could vote, they'd elect a Mom to the County Board of Education ... and my Mom would be great! She has such a passion for helping kids and public education. (our emphasis) I could not be any prouder of her!" While using a candidate's child as a political prop is a risky practice on several levels, there was one word missing from the young Ms. Davis' copy and that word is "funded," which should have been placed between public and education. 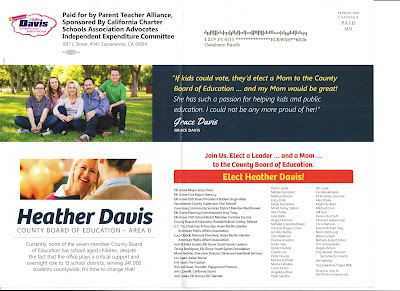 Although the mailer does not directly address it in the copy, Heather Davis' campaign benefactor has been an independent expenditure committee of the California Charter Schools Association, the employer of her husband, Mayor Gary Davis. While money flowing from independent expenditure committees is a now common practice in almost every election, it is curious that aside from the disclosure of who paid for the mailer, there in no mention of Davis' support for charter schools in the copy. While we won't quibble with Davis' support for quasi-private charter schools, which by the way are "public funded education," we question why is there no disclosure of what her position is on the controversial topic. While proponents on both sides of the charter school can make their arguments, if Davis is a true believer, why not show political courage and stand up for your beliefs? A reasonable person might come to the conclusion when a candidate dodges addressing something their whole family believes in, an act of deception is underway. We have no argument with Davis' position on charter schools - we each have our own prerogatives - but if this is your belief, own it, embrace it, and most importantly, don't try deceiving voters. I notice the teachers unions have endorsed Nguyen. So much for the charter school agenda!